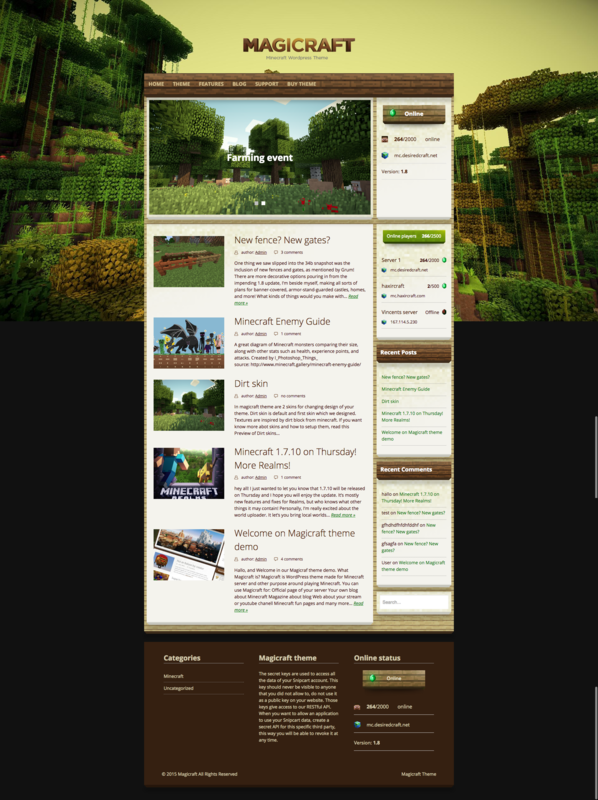 Magicraft is a WordPress theme designed especially for the Minecraft servers. Online status will keep you informed about how many players are currently online on your server. Theme graphics is setting Minecraft mood and offers a lot of customization and skins, which change the mood of whole page with just several clicks. Magicraft is a fluid and fully responsive theme, which is adapting display to all devices (smartphones, tablets, laptops, desktops …). The theme also serves as a great blogging tool. Source code of theme is highly semantic and well structured, which is very good for all search engines – SEO optimalized. Magicraft was designed to present your Minecraft server, so you can focus on making your server great in-game.